Donegan 4-pc. Queen Bedroom Set Creating a cozy, restful retreat is easy with this Donegan 4-piece queen bedroom set. Along with its rich, brown cherry finish, this group's elegant details, like antiqued-bronze hardware and bun feet, combine to deliver a timeless quality and a beautiful appearance. This bedroom set is functional too, with features like the bed's built-in footboard storage, which is perfect for storing clothes and blankets. Creating a cozy, restful retreat is easy with this Donegan 4-piece queen bedroom set. Along with its rich, brown cherry finish, this group's elegant details, like antiqued-bronze hardware and bun feet, combine to deliver a timeless quality and a beautiful appearance. This bedroom set is functional too, with features like the bed's built-in footboard storage, which is perfect for storing clothes and blankets. Overall Set Weight: 499 lbs. L: 96.5" x W: 65.5" x H: 57.5"
L: 65.5" x W: 18" x H: 40.5"
L: 42.5" x W: 2.5" x H: 36.5"
L: 29" x W: 18" x H: 30.5"
I had researched several different products. Looked at several to get the feel of the different bedroom sets. I decided upon this one because of the dark rich finish. It is a tad big for my bedroom but it is very nice. I have had several comments that I have good taste for a man. I laughed, but when you know what you like and are willing to take chance it will works. I would recommend this for anyone that is looking to upgrade their current bedroom. I added the chest for added storage. Construction of the set is very good. We purchased this set about six months ago and added the chest and an additional nightstand. The furniture is very solid.The drawers are a good size, nicely finished inside and are very smooth in opening and closing. The nightstands are holding up well, no marks or scratches yet. They have a very large drawer for the bottom one with a hidden shelf. 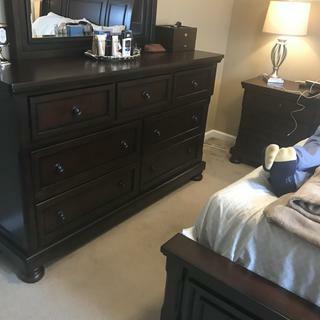 The bed is super sturdy.The extra drawers under the bed are a pretty good size, they're very deep.The added chest has tons of room as well. In general it's a great set for being on the cheaper end of the bedroom sets. I bought this set and added a chest, it is very well constructed and looks great in the room. Be careful to measure the room first, I had to rearrange the pieces because the room was smaller than I thought. This bedroom set is just gorgeous! The quality of the wood is amazing. I looks even better in my home than in the showroom. I just love it! There is so much storage space within the units. This set was nice in the store, but I absolutely love it in my bedroom! I have a tray ceiling so I was looking for a quality bedroom set without breaking my budget. I couldn't be happier with my purchase. We were looking to update our bedroom set, and we couldn't be happier with the experience, starting with the Saleswoman who helped us make the selection to the polite delivery men who did a great job of setting up our furniture. We got a great price, and we love this bedroom set. It's sturdy, with plenty of storage and it looks great. I am very happy with my purchase. Starting with the salesmen, down to the delivery people. Love the whole bedroom set!!! After getting this set I couldn't be happier. High quality material with a quality finish. Awesome, classy, and very affordable! This is by far the best "bang for your buck". I have compared many different stores product line , and this crushes the competition. The construction is flawless, all details such as roller glide drawers are in place. Absolutely LOVE this set ! Beautiful! Much more beautiful in person. Drawers are deep and furniture well constructed. Wonderful bedroom set. I was able to buy a dresser, bed frame, side tables and a chest. The set matches with any kind of Decor in the house and the delivery guys were great! They were in and out and set up everything without any scratches. I love the quality of the frame and dresser. Everything looks like something out of a magazine! It’s beautiful lots of room. I would recommend this bed to anyone i love it. I love the bed it is so comfortable. Do you need mattress and box spring? BEST ANSWER: In the section that says Features and Demensions: It is stated that this bed does not require a box spring. We bought this set today and was told we only need a mattress. What does the 4 pc. set include? BEST ANSWER: The Donegan 4-pc Queen Bedroom Set is crafted of pine and engineered wood, with a birch veneer. it says that it is a true platform bed and does need a box spring but your questions answers that it does need a box spring. which is it? BEST ANSWER: The Donegan Queen Platform bed does not require a box spring. Can I just purchase the bed? BEST ANSWER: Yes, you can purchase the Donegan Queen Platform Storage Bed. It is displayed online under SKU number 599321595. Please call 866-383-4484 option 3 for assistance with your purchase. Is this available in FULL instead of queen? BEST ANSWER: This bed is only available in the Queen and King size. Answers regarding box spring are confusing. Which answer is correct and who is the author. also would the answer be the same for the kingsize? BEST ANSWER: This bed is a true platform bed and does not require a box spring. It you would like to raise up the mattress yu can use one but it is not required. I have had this bedroom set for two years now and had the box spring on my bed prior to getting this set. It is totally your call. I didn’t put the box spring on mine because it would be like climbing Mount Everest to get into bed every night as this is a platform bed. A box spring is NOT required. what is it made out of? what type of wood? Who manufactures the Donegan set? BEST ANSWER: Hello Sonia! Homelegance is the manufacturer of the Donegan collection. What tool did you use to tighten up the sticks below the bed? BEST ANSWER: For assistance, please contact customer care at 866.383.4484, option 2! Do you have assembly instructions online. ?I moved and cannot figure how to put bed back together can you help? can i use split box spring? BEST ANSWER: Yes. A split box spring can be used. BEST ANSWER: You can use a box spring with this bed. Can the platform be disassembled to make delivery possible? BEST ANSWER: The Donegan Queen Bed can be disassembled for delivery. does the platform of the bed come preassembled? i am interested in the donegan queen bed. Is the bed available without the storage? BEST ANSWER: The Donegan bed is not available without the storage. Is there a chest to this set? Is the bed available without storage drawers? BEST ANSWER: The Donegan is only available as a storage bed for immediate delivery. Other choices by this manufacturer may available to special order and can be viewed exclusively through your local Raymour & Flanigan store.